Keeping your family and home safe. StormPoint impact windows and patio doors are scientifically researched, engineered and tested to meet and exceed increasingly stringent coastal regulations. At Lincoln, our products are manufactured to your exacting specifications for a combination of beauty, quality and performance in almost any application or condition. StormPoint products protect the structural integrity of your home or business by building on a successful Lincoln Window platform. The basic premise: start with the foundation of an already high performing Lincoln product and make it stronger. This was done by using specifically designed reinforcements and laminated glass while incorporating heavy duty hardware. Performance engineered windows and patio doors - our specialty. Quality products, vast options and on-time deliveries - our commitment. Satisfied customers - our mission! 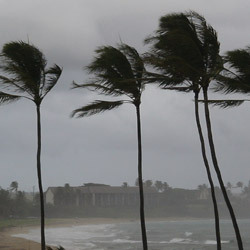 During windstorms and hurricanes, wind-borne debris is common. Debris slams into windows, and following impact, windows may be subjected to sustained, gusting winds. To protect a building or residence, windows and patio doors must resist penetration by debris and remain in place and intact throughout the storm. If the building envelope is breached through a broken window or patio door, wind may enter the building, causing an increase in pressure that could lift the roof and push the walls outward. 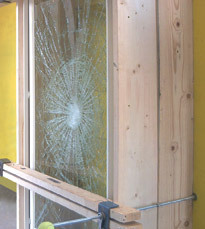 Tests show that specially designed laminated glass products pass wind-borne debris impact tests, and when broken, the glass fragments tend to remain integral, adhering to the plastic interlayer, helping to preserve the stability of the building envelope. Lincoln's StormPoint Series products have been developed for areas prone to hurricanes and windstorms. Protecting the structural integrity of a residence or building during one of these storms is crucial. Our impact product has been scientifically researched, engineered and tested to meet this challenge. We started with the foundation of an already high performing Lincoln product and made it stronger by using specifically designed reinforcements and Sea-Storm laminated glass while incorporating heavy duty hardware. Areas prone to hurricanes and windstorms are categorized into four wind-borne debris zones. Each zone indicates the wind speeds that are possible in that area during a hurricane. Building code certification standards have been developed for each zone which require a home be able to withstand harsh environmental conditions. NOTE: Codes for local jurisdictions may vary. Selecting the appropriate StormPoint products to ensure compliance with all building codes is the sole responsibility of the architect, builder, developer and/or owner. Contact your local building code officials for more information. Every StormPoint product is put through a rigorous set of tests to ensure they meet ASTM certification standards. The results of these tests also indicate what protection level and wind-borne debris zone each product is certified for. All Lincoln StormPoint product meet the requirements for Missile Level D, Zone 3. Zone 1 Locations within 1 mile of the mean high tide and Hawaii with winds from 110 mph up to 120 mph. Must withstand a 4-foot long 2x4 at 40 feet per second (27 mph). Hurricane simulation of 9,000 high wind cycles. Zone 2 Locations greater than 1 mile of mean high tide with winds from 120 mph up to 130 mph. Must withstand a 4-foot long 2x4 at 40 feet per second (27 mph). Hurricane simulation of 9,000 high wind cycles. Zone 3 Locations greater than 1 mile of mean high tide with winds from 130 mph up to 140 mph, or locations within 1 mile of mean high tide with winds from 120 mph up to 140 mph. Must withstand a 8-foot long 2x4 at 50 feet per second (34 mph). Hurricane simulation of 9,000 high wind cycles. Zone 4 All locations with winds grater than 140 mph. Must withstand a 8-foot long 2x4 at 50 feet per second (34 mph) as well as possible multiple hits per test unit and mullions. Hurricane simulation of 9,000 high wind cycles. Level C Qualifies the product for Basic Protection in Wind Zones 1 and 2 for buildings less than or equal to 30 feet in height and in Wind Zones 1, 2, 3, and 4 for buildings greater than 30 feet in height. Level D Qualifies the product for Basic Protection in Wind Zones 1, 2, 3, and 4 for buildings less than or equal to 30 feet in height and buildings greater than 30 feet in height; Enhanced Protection in Wind Zones 1, 2, 3, and 4 for buildings greater than 30 feet in height; and Enhanced Protection in Wind Zones 1 and 2 for buildings equal to or less than 30 feet in height. Protection All building and structures not listed for Enhanced Protection. Protection Buildings and other structures designated as essential facilities, including, but not limited to, hospitals; other health care facilities having emergency treatment facilities; jails and detention facilities; rescue and police stations, and emergency vehicle garages; designated emergency shelters; communications centers and other facilities required for emergency response; power generating stations; other public utility facilities required in an emergency; and buildings and other structures having critical national defense functions. StormPoint products are built to withstand unpredictable weather by incorporating Sea-Storm® laminated glass. 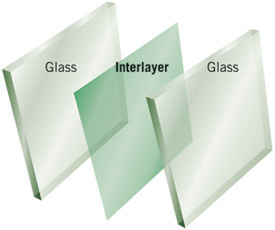 This special glass is produced by bonding a combination of plastic vinyl layers and polyester film between two panes of glass into a single sheet. Sea-Storm® glass looks like ordinary glass, but is designed to pass stringent building requirements in high wind speed areas. It protects like a shield against accidental impact, forced entry, sun damage and unwanted noise. 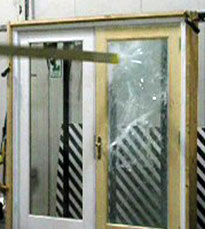 Extensive testing shows that upon impact, broken glass fragments tend to adhere to the durable, bonded plastic vinyl interlayer, reducing the risk of injury and damage. You’ve probably spent countless hours designing your dream home and will make a significant investment building it in both time and money. Protecting this important asset against severe weather conditions, by choosing impact products with laminated glass, only makes sense.